Most often when photographers start using their flashguns out of the directly-forward position, they move the flash head to point 45’ or 90’ upward. The idea here is to bounce flash off the ceiling. Even though this is an improvement in most cases over using the flashgun pointing directly forward, this is also most often not ideal. We can improve on this. If we consider how studio lights are set up, we’ll rarely see a light source directly overhead of our subject. Top lighting just isn’t as flattering as light coming in from an angle to the subject. And in the same way, why would we want to bounce flash directly overhead of our subjects? The subtitle of this post should be: You don’t really need that Lightsphere . We need to consider the direction of our light carefully. This is one of the areas in which we can really set ourselves apart as photographers – by carefully choosing the direction our light falls onto our subject, we can control the mood of the photograph completely. We have to think of the actual area that we’re bouncing light off, as our light source – and not of the flashgun as our light source. Looking at this, we can see that the direction of light came from slightly behind the subject to the camera’s left. The light falling on the bride was from a single on-camera speedlight. A very important point here is that there is there is no light coming from ‘camera’s viewpoint’. In other words, from our viewpoint (which is the camera’s viewpoint), there is no light coming from directly forward. Therefore, instead of a flat even light, we have directional light. Light is coming in from the side, and creating that interplay between light and shade that creates shape and gives dimension to our subjects. The exact way that flash was bounced here, was by pointing the flashhead 45’ swiveled to the camera’s left, and tilted about 30’ up. To stop any direct flash falling onto the bride, I blocked the strobe with my left hand. This way I shielded the light from her, and the light from the flashgun fell onto the wall to the camera’s left, and slightly behind where she was sitting. So in effect, our light source is coming from above and slightly behind our bride. This way we’re mimicking the effect that a large softbox would’ve given us. It is crucial here that we see that the light was not bounced on the ceiling, or even behind us. Another very important point here to remember is, if your subject can see any part of your flashhead, then you are indeed getting direct flash. Or at least a measure of direct flash. Most often this is not flattering. The entire reason why we are bouncing flash, is to create softer light. And direct light from your flashgun will most often not be flattering and negate the quality of light we’re trying to achieve. Bouncing the light on the ceiling would’ve given darker eye-sockets and that ‘raccoon eyes’ effect. Bouncing light behind us, would’ve given us much softer light from our flashgun than direct flash would’ve given us – but this would’ve produced light that is too flat. 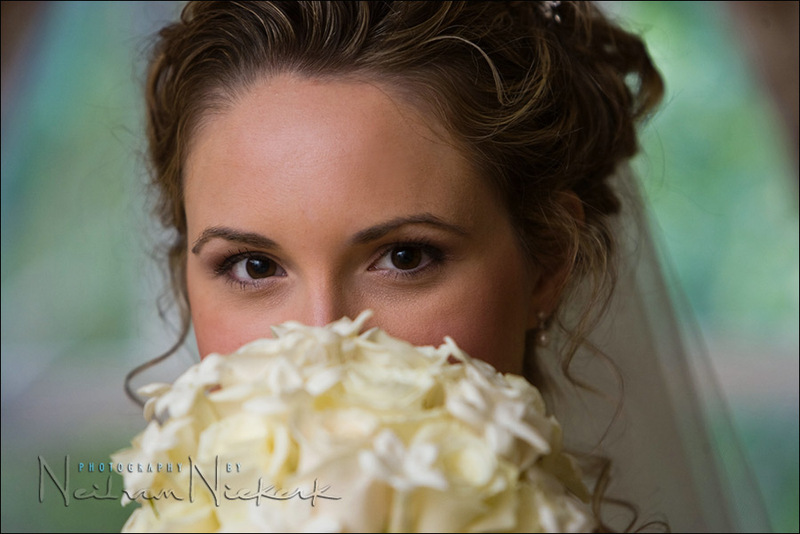 Any off-the-shelf light modifier would’ve thrown too much forward, spilling directly on the bride’s face. That direct light would’ve been unflattering. No flash modifier was used, aside from my hand blocking light. That introduces a color cast, so since then, I’ve started using the black foamie thing as my choice of on-camera light modifier to get this quality of light. Another great post. Reading your how-to on the correct use of on-camera flash has transformed my indoor photography and, what’s more, saved me having to add to Gary Fong’s already-considerable fortune. Top stuff! Hi, my name is Lisa and I’m a reformed Lightsphere user. I’ve just started delving into lighting so I have a question…how would you achieve this look if the wall was painted? Wouldn’t it leave a color cast on the subject (depending on the color of the paint). Would you just bounce off the ceiling in that situation? Great post! Thanks for the information. I just baught my first flash unit (Nikon sb-600) and was really struggling when I was asked to take a few pictures at a friend’s event. I am also interested in the answer to Lisa’s question. What happens when the walls are colored (often dark colors in wedding halls)? What do you do when the room is big and the ceiling is high? Thank you so very much for sharing your wealth of knowledge and expertise with me and all the other photographic enthusiasts who visit your site. Out of all the millions of sites/blogs out there …yours is totally up there above all others …my absolute favourite! (Australian spelling). The way you have set out your pages into categories and the way you explain things (without using all the technical hoohah moohah) makes it easy for me to understand and digest. I live in the hills behind Cairns in far northern eastern Australia and here I am learning more about what I love doing from I guy on the other side of the planet via his website. I always look forward to your new entries. Thanks again. Lisa and Nimrod .. yes, the color balance of the light from your flashgun does change when you bounce it off a colored surface. Which is why shooting in RAW makes post-processing easier. If the color of the wall is a deep color, then it is very likely that not the entire spectrum of light is reflected … and this discontinuous spectrum makes color correction a little tougher. That said, I have photos where I’ve bounced flash off foliage behind me, and very easily corrected for the Martian-green skin tones. Lol, thanks Neil! I JUST shot RAW for the first time, so I guess I’m prepared to go forth and bounce off colored walls! I’ve been photographing flash-less, and decided to start shooting with flash. Unfortunately, I’ve invested in one of Gary Fong’s whaletails. I’m still practicing flash photography with and without the diffuser, but found your tutorial to be amazing. At a recent photoshoot, outdoors, I was trying to illuminate properly with fill flash(no diffuser, was being shipped), with the setting sun as backlight. Was a pain. :) I had completely forgotten to expose for the sky. Love your before/after, with/without photographs. Very easy to absorb and see what you are talking about. Great website… I just discovered by DWF and I already love it. I really appreciate your last example with the before/after as Wing sais. Is the kind of picture I’m always looking for… to be able to let the background almost intact and add some flash light well controlled in order to get a well balanced image. Because of how TTL flash works, your choice of aperture and ISO doesn’t influence your flash exposure like it would with manual flash. With TTL flash, your choice of aperture and ISO becomes ‘transparent’. So you need to control your flash in another way. I’m in the process of writing up an article on this, so check back in a week or two. Neil, just wanted to say thank you for this great site. Been using flash for around six months now, having decided after years of avoidance to learn how to use artificial lighting, and I’ve really struggled with ‘raccoon eyes’ and sometimes hard shadows on faces. I knew what I was trying to do, but until I found this site couldn’t quite work out how to get there. Thanks again. Do you ever do UK workshops or CD tutorials? Hi there Eileen .. thank you for the kind words. Here are the video tutorials on photography that I have available. I’ve had other requests for workshops in the UK, so this too might take off some time in the future. Hi Neil..first of all, just like others i’d like to say a big thank you for your website. After searching for other a-like websites to properly understand a good technique of flash photography, yours has to be on top! I have a quick question and am not sure if I have missed it whilst reading through your pages. With your bounce card, I have noticed that yours is black. Are there any advantages of using black over white? Thanks! The reason why I use a black card to flag my light (or to specifically direct my light), is because in most cases I would rather not throw any light forward. A white bounce card would’ve done that. I’ll add a more in-depth explanation in the next week or so. I stumbled upon your site yesterday and I have to echo the laudatory comments of previous posters. You are the man! I’m just getting into flash and I’ve already learned so much from your excellent tutorials which are comprehensible and encouraging. Simply brilliant. You are clearly a gifted teacher and if you come to the UK, I’ll be there! WOW, your blog is just amazing. Love it. Love it. Love it! So much easier to understand than some of the popular other blogs. More pics and easy to understand. Good on you for sharing your knowledge! Please let me know if you are planning anything for Australia. Hi there Andre and Dedrei .. Always feels good to hear that the web pages are of such help. I must echo what so many others have said before me: A great thanks for giving this easy to understand tutorial of how to use on-camera flash. After spending some days on the strobist blog, I thought I would need to invest in off-camera lights for great shots. Your site has convinced me that I can learn so much more with on-camera falsh still. Thanks for your time. One question on this post. You bounce the flash up to the behind left of the bride, shielding with your hand so there should be direct light falling on the bride. However, I notive very nice catchlights in her eyes. How did you achieve these catchlights if there is no direct light reching the subject? 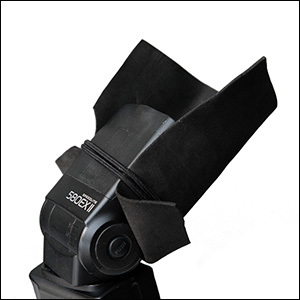 There will automatically be catchlights when using the on-camera flash like this. Since we’re approximating the idea of a studio softbox in where we want our light to come from, we’ll get similar catch-lights. It has everything to do with the direction of our light-source. When you think about it, it just has to make sense that there will be catchlights. It might just be one of those things that you need to try and out see for yourself that the result is repeatable. Just wanted to THANK YOU for this blog – it has taught me more than any other resource on lighting. I love my speedlight now that you have shown me how to use it properly. What were your settings for these shots?? I’m assuming that your ISO must have been pretty high, and the aperture somewhat wide open…was the SHutter speed close to your Flash Synch speed since the background was so bright?? Just wondering if you metered for the bride?? or out the window?? 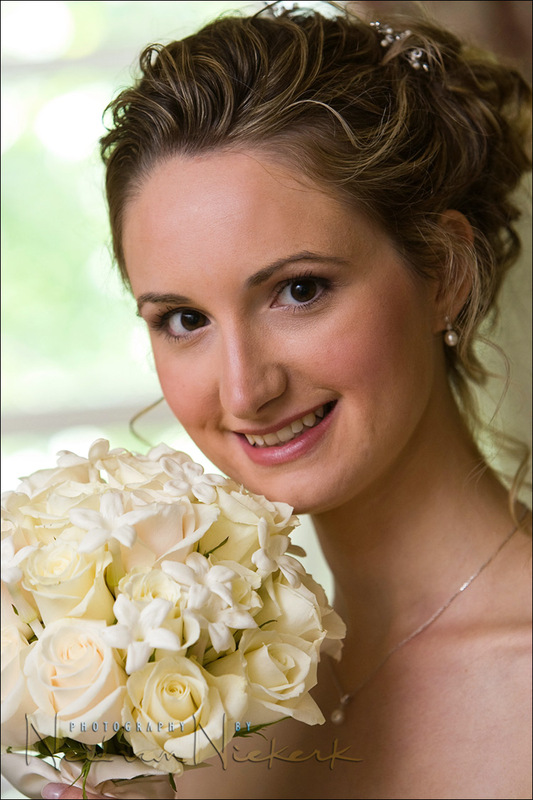 If you metered for the bride in the low light situation, wouldn’t your background be blown out? Yet it remains so beautifully intact…thanks in advance. I’m learning so much from reading and re-reading all the info that you post. The actual settings aren’t that critical, since the TTL flash technology (with a little nudging via flash exposure compensation), takes care of the exposure. And if the available light levels are a fair amount below the flash exposure, then you have a lot of headroom to play with your settings. In other words, whether I had chosen 1/125th @ f4 … or 1/160th @ f5 isn’t of much relevance if the ambient light is 2 or more stops below that. In the examples above, my camera was set to 500 ISO. But again, this could’ve been anywhere from 400 to 800 ISO. It doesn’t matter as much as most people would think. I didn’t meter for the bride. I just took a test shot to see that I do get some detail of the outside … and then I just used TTL flash to expose for everything inside the room, and in particular the bride. If I had metered for her, then the background would’ve blown out completely. And that would’ve been fine too .. but would’ve looked very different from the examples here. first off all i’d like to say a big thank you for your website.great! i have a problem with the direction of the speedlight..my head mixed:) can you draw the direction of light that come from the bridge? i still can’t solve it:)thanks..
Amazing site – great work, my flash work is coming on leaps & bounds. However, I don’t use a tripod for a lot of my photography and find that shielding the flash with my hand compromises the steadiness of the camera – any suggestions to overcome this? Once again, thanks so much for this very informative and helpful site. Please keep it up. Today, I was so inspired to get my flash out and try out a couple of on camera bounce flash test shots. Man oh man, I even tried out your 45 degree angle to the left of my subject and then 30 degrees up and I can only say… amazing. It worked so well. My subject was inside and in front of a relatively bright window but with overcast weather outside. My test shot for metering purposes without the flash firing was just as yours was, with my subject all dark. I then tried out various apertures and finally came up with f 5 as the best one of the lot. My ISO was set to 400 and I was up to the maximum sync speed of my camera and Sigma EF-530 DG ST flash. I have a Canon EOS 350 D. My lense was the EF 50mm 1:1.8 II. In the end the light coming in from the window was a bit blown out, but I don’t mind that because my subject came out really well. I actually uploaded it to your flash photography techniques on flickr. I have been devouring the information on this site for the past few days as I just got my first speedlight and want to understand the result that I’m trying to achieve before even practicing with it. Thank you so much for the invaluable information. I am trying to picture where to place my hand to block the shot? Did you do this instead of using the foam 1/2 snoot? If so, why? Sarai .. I used my hand simply to shield the light from my flash so that none of it fell directly on my bride. WOW, Brilliant trick. Thanks for posting! I’ve been bouncing the flash off the walls but I was NOT blocking the direct light by hand. Make sure to read this page as well .. my choice of flash modifiers. I echo everyone else’s sentiments on the amazing information you provided. Did you ever consider making a DVD tutorial… putting all your blog info into one comprehensive DVD? I would be first to purchase it. Thanks again for your outstanding information. It has transformed the way I think and go about my indoor photography. Thanks Neil ! I enjoy reading your tutorials. They have helped me..plan to direct some photography students that I have worked with spring semster to your site. I have just ordered your book which I hope will enlighten me further but I wanted to ask how you would cope shooting a couple in a wood panelled room where there isn’t really anywhere to bounce the flash? One particular shot was on the stairs, surrounded by dark wood and an open doorway behind me into yet another dark room, so nowhere to bounce the flash. I have several weddings in a venue like this and am struggling to get the results I’d like. Really hope you can help, I love your blog, it’s brilliant! Helen .. there are times when you have to devise other options, such as using off-camera lighting. Bounce flash does have obvious limitations, and then we have to explore further with our lighting techniques. Hi Neil. Just purchased your book and I have also read several articles on your website. Thanks for sharing! I have a question that I see someone else asked earlier. I don’t understand how it can be correct that the light is offset 45degrees to the left (thrown behind the bride) and how you get the beautiful catchlight in her eyes as if the light was thrown behind your own shoulder? It seems like there is a softbox-like source of light in front of her? Terje … the area that the flash bounces off, now becomes the actual light source .. and by the time the flash hits that part of the wall and ceiling, it is a pretty big light source .. hence it will show up as that catch-light reflected in her eyes. It’s just one of those things where it just works this way … and when you try it, you’ll find the same. I like the hand idea… i always tries to stick some small “shield” to protect direct light. Its slow and it looks strange too. :) Use a hand… how simple. Thanks for sharing! One question: my SB-800 has quite limitation to tilt position… it starts at 45 degres which is very often to much. Any idea how to keep it at your 30 or less? Jan .. then the flash was probably at 45 degrees and not 30. The difference in my description isn’t of consequence. I’ve only just found this and am ‘baie gelukkig’ to find a fellow African with such a brilliant blog. Thank you so much for sharing so clearly, your wealth of experience & know-how. Till now my ref has been strobist and am thrilled to have found this. Just wondered if your ambient is as low as e.g shows with no flash, didn’t you need at least a reflector to fill the opposite side of the flash – here, the right side? Hi there Suzanne … not a bad place to have landed up in! About the fill light .. you don’t need to add fill light via a reflector. With the light from the flash bouncing around the room, there will be enough fill light on the shaded side. You can’t control how much fill light there will be, but there will be fill light. I’ve read so many contradicting opinions on all lighting questions that I just didn’t know which to believe! However, having read many of your articles you have impressed me with your knowledge and creativity that you’ve become my only point of reference. Your images are stunning and your site is so well written that I rarely go anywhere else for inspiration. I’ve a few questions for you, if you don’t mind. I appreciate that you may have answered these elsewhere but there’s so much to take it I most likely missed them somewhere along the line. Any help you can give would be most appreciated. I also appreciate that these questions may seem a little basic! 1. You often say that you simply bounce your flash behind you (in general terms), and I get the impression that you do this regardless of what is behind you. Is this the case? If so, what if there is no wall or other surface sufficiently close for the flash to bounce back effectively? What would you do? I admit that my physics knowledge is somewhat lacking, but if a surface is so far away, does the flash light not die by the time it gets there and back onto the subject? Or, am I to assume that your flash is capable of such distances? (I use a Canon 580ex II). 2. When bouncing behind you – and I think this may apply for portrait orientation more than landscape – do you not get in the way of the light when it bounces back? 3. How do you know how much +ve FEC to dial-in? (I am assuming that, mostly, you need to dial-in such because you are bouncing). 4. Correct me if I am wrong, but your methods seem to eliminate the need for flash brackets (particularly for portrait orientation). Would you agree? If so, are there any circumstances whatsoever when you would use a flash bracket? 5. I assume (I don’t know why!) that bounce is not appropriate for ultra low-light dragging the shutter work? Instead direct flash is better? If so, where would you point the flash, would you use any accessories (stofen etc) and what -ve FEC would you dial-in? Thank you in advance for your answers – keep up the excellent work. Hi there Stacey … I replied to your questions with a new blog post – bouncing flash behind you. Just discovered your site. Im enjoying it very much. However, when you stated you covered the flash with your hand, did you cover just the end of flash or whole body of flash? My hand is quite small and there are times when I need to do this. first of all, Merry Christmas ! My question is – Do you have specific way of turning flash head ? I mean – You tilt about 45 ` up, but the flashgun is set to forward or backward in relation to subject ? You are going to have to work through the various linked tutorials and figure this out. All the info is there. So the question is not where to put my flash, but where do I want my light come from. Thank you Neil. By the way, where is the search button ? Top right-hand side of this blog. I greatly admire your teachings. Thank you very much!!! I have a question on directional light from your book “Direction and quality of light” (An EXCELLENT BOOK and I’ve ordered the other 2 books): On loc 755 of 2319 (the kindle copy) there is a superb photo of Noreen, with the explanation of light bounced off a wall to camera left. Her pupils are large, consistent with low ambient light and the light on her pupil is small and rectangular shaped, on the upper, outer part of her pupil. How does that occur with bounced light off a wall, or was it a small portion of wall, above and to her right? I would have presumed the source was a light box. The setup is as described in the book, and this blog post: Short lighting with bounce flash. The size of the catch-light there is really a nice side-effect of bouncing on-camera flash this way.